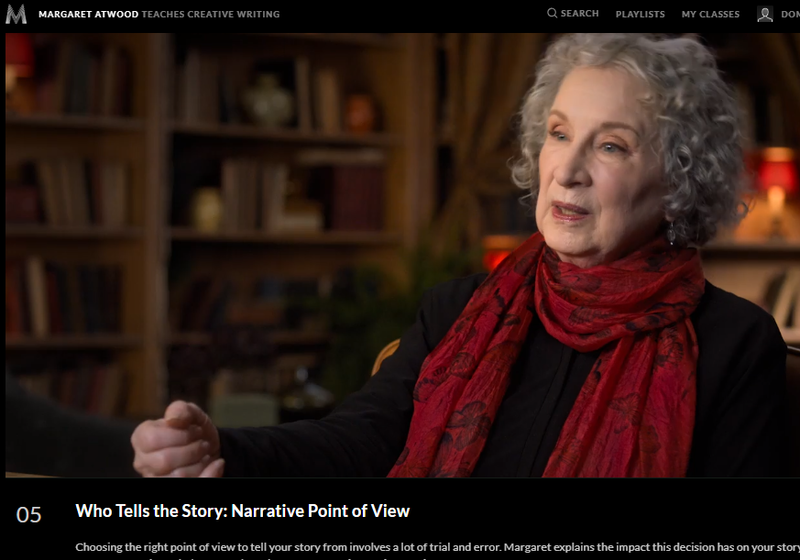 Margaret Atwood shares 50 years of writing experience in this very interesting and informative Masterclass.com course. 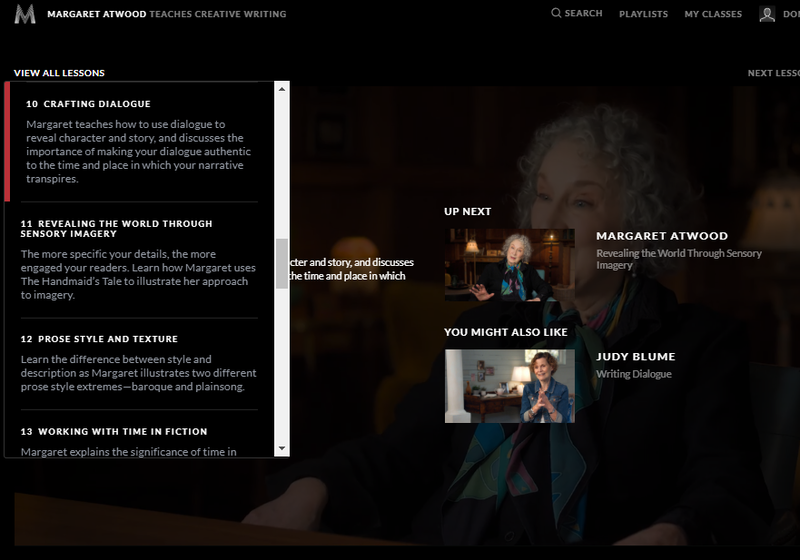 After the introduction, Margaret Atwood explains how she became a published writer. An interesting story, but, I was glad when she dived into the course proper and started to explain her creative process. Margaret gets most of her ideas by immersing herself in a subject. Something she believes every writer needs to do. But, when it comes to pulling together and developing ideas, the process is different for everyone. She urges you to just write and not let fear stand in your way. If you find yourself feeling afraid to write, Margaret’s advice is to identify the root of that fear. Once you have done that, you can find yourself a way through the issue and start your writing journey. In this section of the course, Margaret explains that every story has its own set of building blocks. The elements that make up a good story vary from culture to culture. But, they are all there for you to learn and gain inspiration from. The more you read the easier it will become for you to write a good story. 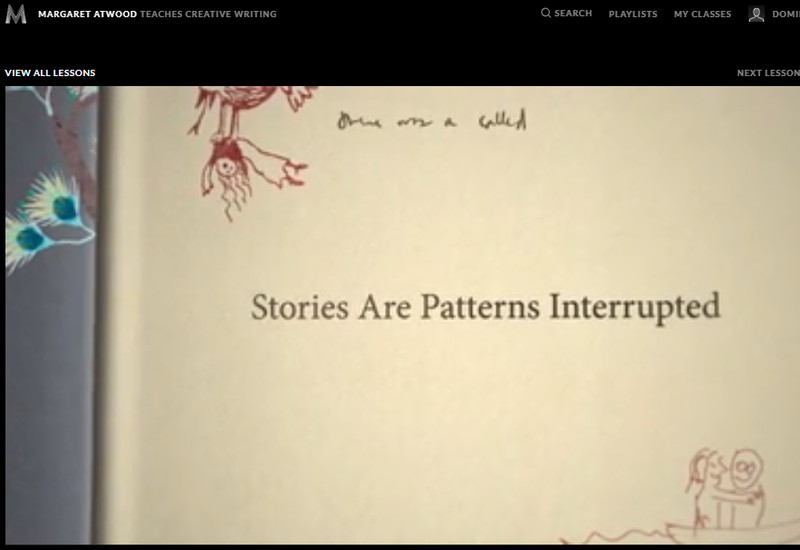 She explains that something different has to happen to turn what you are writing into a story. The normal daily pattern has to be broken. This sounds a little odd, but once she shares a few examples with you, I promise everything makes sense. This was a fascinating section of the course. Margaret starts by telling you the first part of Little Red Riding Hood in two different ways. The first time she tells it the traditional way. Then, the 2nd time, from the perspective of the grandmother, who, very weirdly, is alive in the wolf’s stomach. She then goes on to quickly come up with half a dozen other perspectives and ways to tell the story. All very odd, but she quickly and clearly demonstrates how many different ways there are to tell a story. It certainly gets you thinking. She goes on to mention some of the numerous ways stories have been told, down the centuries. 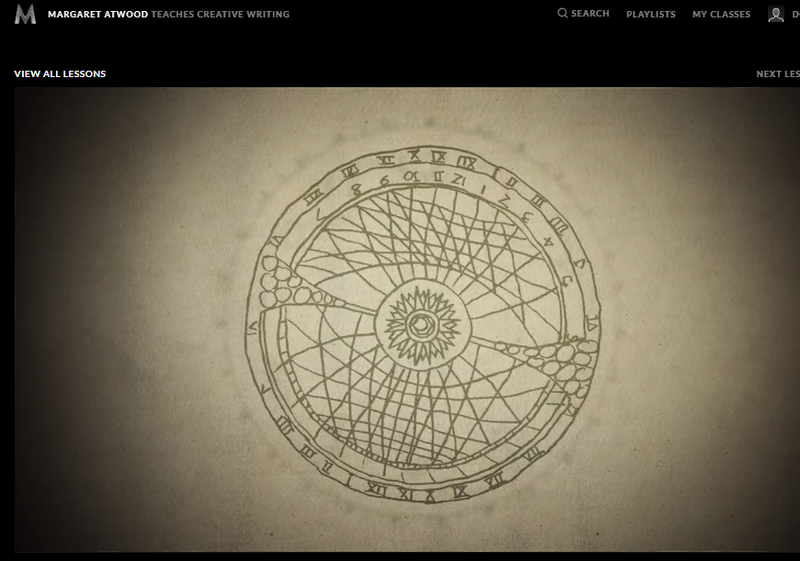 For example, the frame technique used to pull together the stories of the Arabian Nights into a convincing narrative. In fact, Margaret recommends that you read through the Arabian Nights because it contains numerous story formats. To help you along the way Margaret has included one of those stories in her workbook. Working out who is going to narrate the story is clearly quite tricky. 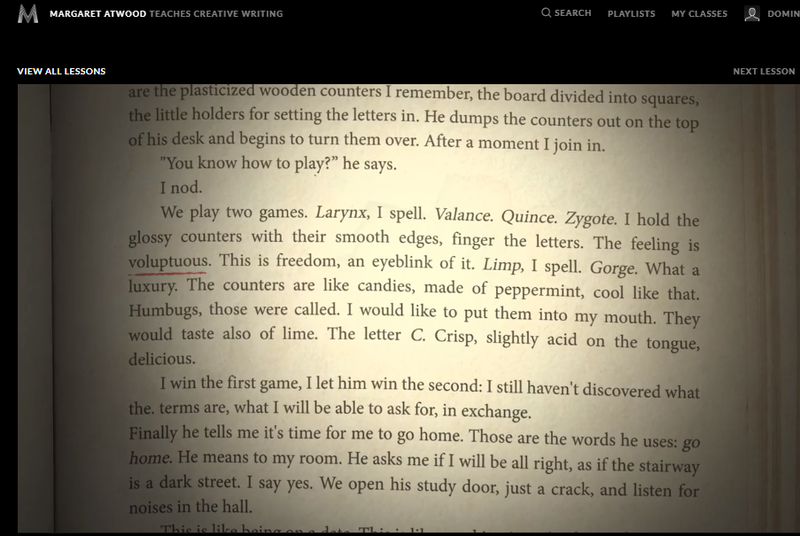 During this section of the course, Margaret Atwood reveals that she has written the start of some of her stories several times over. Disappointingly, it appears that there is no easy way to work out who is going to tell the story. You just have to start writing from the point of view that you feel is likely to work best. But, she does share some tips to help you to narrow down your options. Working out from whose perspective the story would be most interesting is my favorite of the approaches she suggests. Possibly because she demonstrated the technique using the example of a stapler having a romantic encounter with a box. I appreciate that sounds odd, but it actually was a good demonstration. A brilliant way to demonstrate how to assess your various options. Margaret has a mischievous side to her, which is one of the reasons this course was so enjoyable. Plus, things become a lot clearer when she takes you through a full case study using her book Alias Grace. You find out who characters are by how they act. So, you need to create action in your story. It is the only way to make your characters come alive. Margaret’s tip of creating a timeline for each important person in your book is an excellent one. You need to write down when they were born, then mark down important events that occurred during their lifetime, including world events. This will help you to decide what impact they would have had on your character. For example, 9-11. If someone was 2 when that event happened it will have had a far smaller impact on them than if they were 12. Knowing where your characters sit in the timeline of history and when important life events happened to them, is very helpful. So is building up a picture of what they look like physically and how they dress. Little things like what they eat and how they dress say a lot about who they are. Getting expert advice is also important. If you are writing about a maths genius, speak to a real one. Also, let someone who is of a similar age and socioeconomic background read your book to make sure that the characters sound convincing them. There is no doubt that Margaret Atwood’s characters are compelling. You only have to read The Handmaid’s Tale to realize that is the case. So, I was interested to find out how she achieved this. Unfortunately, I am still not 100% sure. In my view, this was not the best section of the course. She was very clear that villains, liers and unpredictable characters are compelling. But, does not really cover how to create them. When you write, at some point you will struggle. At least that is my experience. It is not just writer’s block. Writing for long periods of time can be uncomfortable and maintaining a high standard is tricky too. So, this part of the course was really good for me personally. Here are details of some of the tips Margaret Atwood shares. From some of the other masterclass writing classes I have taken, I have learned about the importance of good dialogue. But, for some reason, what Margaret had to say on the subject was far easier to follow and understand. It rang true more, for me. I also like the fact that she covered how to use overheard dialogue as a way of moving the story along. The examples she gave from Alias Grace helped to make this part of the course more memorable. While reading, I have noticed that the authors that capture my imagination the most never generalize. If they are talking about a sidewalk they will add a bit more detail enabling me to create an image in my mind. Margaret explains how to tap into the reader’s senses to help them to see the world that you have created. She explains how to hone and enhance your own sensory perceptions. Doing this helps you to pick up on what something feels, sounds and even smells like. Once you start noticing these things you will naturally begin to incorporate them into your writing and enrich the stories you are telling. 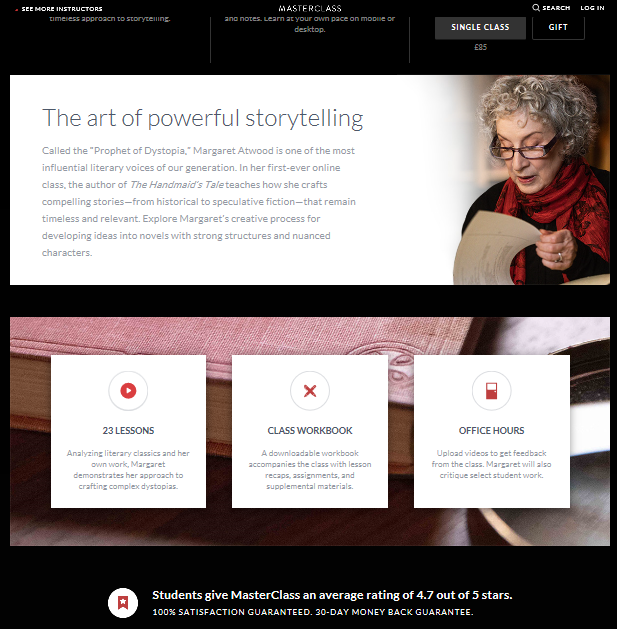 I have used my masterclass.com all-access pass to complete 12 courses, so far, including several of the writing courses. This is the first time the subject of prose style and texture was covered. It is definitely a part of the course that I will be going back to. Working out how you are going to handle time in your story is important. It is a difficult subject to understand. Margaret explains the difference between linear and circular time. She tells you how to utilize storytelling tricks, like flashbacks. When to use them and how to recognize when they will get in the way. Across the course of several videos, Margaret explains how to structure your book. She covers this subject in depth, in particular, the beginning. Specifically the first five pages. Interestingly, she says that often when she writes a book the first beginning is not the one that she goes with. To help you to better understand how to write your first five pages, Margaret includes several great examples in her workbook, including some from classic novels like Frankenstein. For the middle, she focuses on keeping the reader engaged. Making sure that they read on. Again, she explains that, often, you have to change things. It is at this point that you are likely to realize that something you have written about your character isn’t true. If you come up with something better, don’t worry it is not poor planning these things just change things. The ending is just as important as the beginning. You need to decide whether you are going to use a closed or open ending. She explains the difference and provides you with a simple way to figure out which approach is right for you. Overcome your completion fear and just finish. Margaret starts this section of the course by explaining that a lot of writers struggle to finish their books. They worry that it will not be good enough. Her advice is to just finish it and let the revision process sort out any issues. Once you have done everything you can to fix your document, Margaret’s advice is to hand it over to someone else. Initially, someone who is an avid reader, ideally from your target audience. Later, it can be professionally proofread, if you want. To help you to understand how to successfully create speculative fiction, she shares the creative process she used for The Handmaiden’s Tales. Having read the book I found this case study very informative. Fasinating even especially the part about how she created the iconography. The scary thing for me was that she did not make up all of the things she weaved into that book. In fact, I got a bit of a history lesson while watching this video. However, I am not 100% sure that someone who had not read her book or seen the TV series would have been able to glean so much from this video. I was stunned to learn that Margaret Atwood writes her novels first then does her in-depth research. The reverse of what most writers seem to do. However, at that point, she checks every little detail. For example, finding out when plastic bags were first used. Rather than just believe what she reads online she double checks. Looking at magazines from the era and checking the ads was a particularly interesting tip that she shared. Understandably, she usually also employs a historical research specialist, at some point. It is very clear from this section that becoming a successful is typically a long journey. That is if you become successful at all. It is definitely not for the fainthearted. You have to be persistent. Although she did say that it is sometimes possible to become a formulaic writer fairly quickly and earn a living. Apparently, there are publishing houses out there that will give you a tick box script to follow. However, for people who do want to pursue their passion and write unique novels, Margaret explains the different ways you can get published. This includes self-publishing and finding an agent to help you. Once you get published you need to promote your book. So, Margaret includes how to handle interviews and reviews, good or bad. One of the things I like about masterclass.com courses is all of the extras that are included, which you can read about above. One of my favorite extras is the workbook you get with each course. Margaret’s is a particularly good one. It covers all of the important points as well as plenty of additional material. 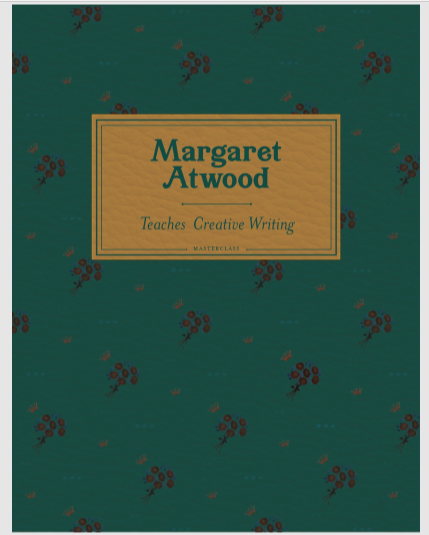 If you are a fan of Margaret Atwood, you will really enjoy getting to know how she creates her masterpieces. She is an excellent teacher who is just as skilled at keeping her students engaged as she is her readers. 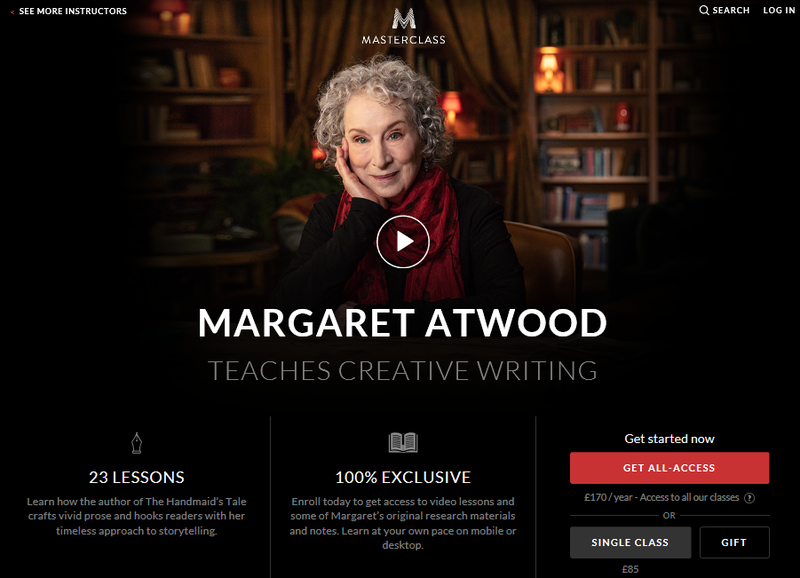 For someone who wants to be a writer or already writes, this is a very good course. As I mentioned above, she covers some subjects I have not yet seen spoken about in other writing courses. All in all, I enjoyed taking it, enough to want to go through it again. Copyright 2019 by Education Speaks.